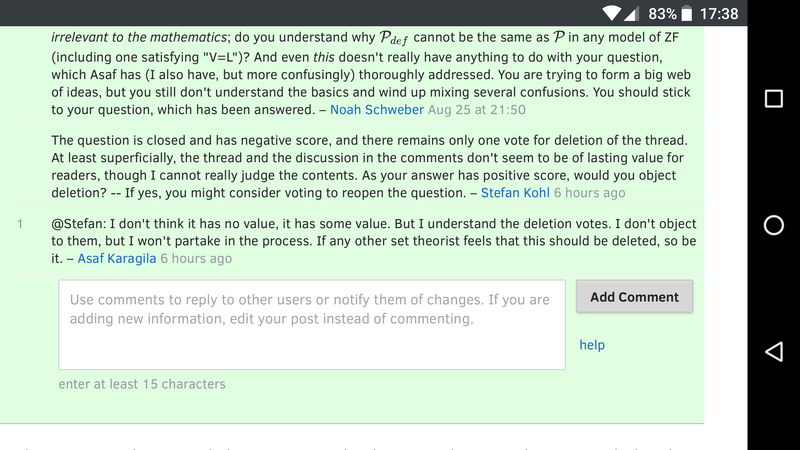 I was leaving a comment on an accepted answer, and I noticed that the "add comment" button was overflowing, as was some of the text of the comments. This appears on several other threads (one, two, three examples), but not on others. And I could not find any patterns which fits the whole thing (e.g. some MathJax causing breakage). Here is a screen shot from Firefox on Android (Nexus 6p) in "full site" mode, while there is no overflow (even the separating lines), something is obviously wrong,for example the separator lines reach all the way to the end of the colored region, while before the add comment dialog is open, they don't. Browse other questions tagged bug design . What's the purpose of the favorite button? How can we visually differentiate MathOverflow from MathStackExchange within the constraints of the new design themes?